Granny, a 103-year-old orca who lives with her pod in the waters off the San Juan Islands in Washington, is truly the nurturing matriarch of her family -- as evidenced by the sighting of Granny swimming among 70 or so orcas with her great-great grandson, T'ilam I'nges and Onyx, the orphaned orca Granny adopted. Photo: Heather MacIntyre Estimated to have been born in 1911 by the Center for Whale Research, Granny made headlines this year when she disproved SeaWorld's age estimates. One of her calves, Samish, gave birth to a female named Hy'Shqa, who in turn gave birth to T'ilam I'nges two years ago. He's one of the youngest Southern Resident killer whales -- only rivaled by one other two-year-old. 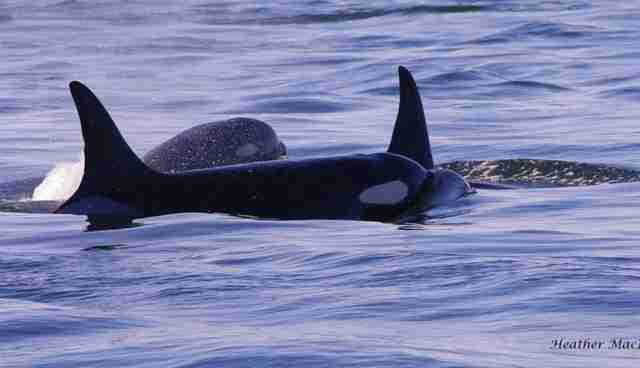 Onyx, 22, left his pod, the L pod, after his mother, Olympia, died in 2005. Then, in a bizarre twist, Onyx latched onto two orcas of the K pod -- a phenomenon that has rarely, if ever, been observed in the wild. Both females caring for him died, likely due to a rash of toxins in the Chinook salmon that they eat that killed 32 orcas from 1995 to 2000. 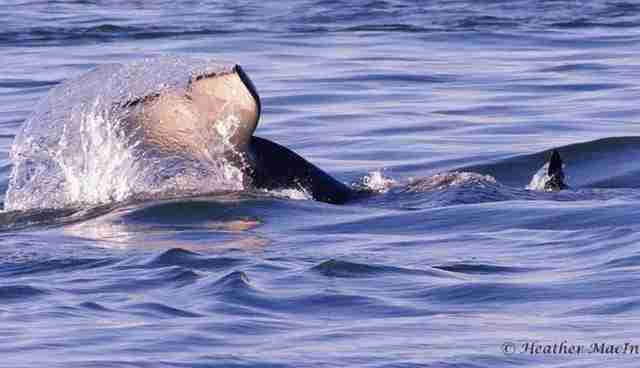 But now, Onyx has now been seen under the fin of Granny (seen below doing a tail slap). The bond between the four generations is just another example of the strong mother-calf bonds in orca societies -- another aspect that marine parks have been criticized for disregarding. Recently, SeaWorld in particular touted the fact that it doesn't separate mothers and calves on Twitter, using a photo of a mother and calf pair that they had in fact separated. According to OrcaLab, pod continuity extends across several generations. 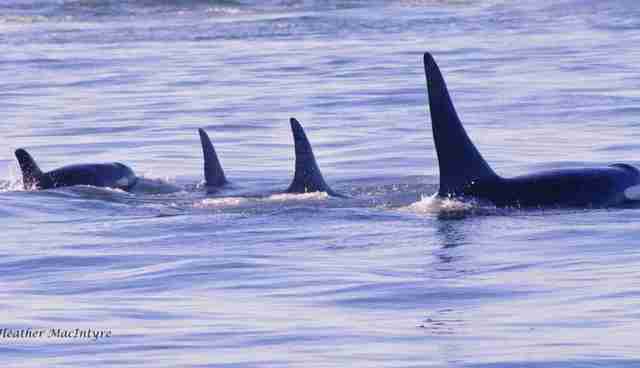 Because orcas live so long and changes to pod composition are slow, development of new pods can take many generations. 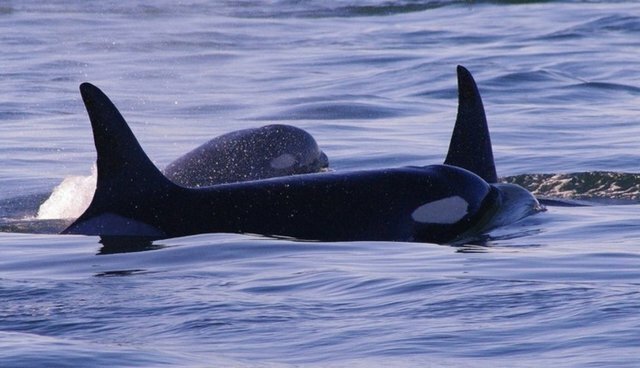 Granny's adoption of Onyx is an example of how the orca family structure works when the mothers die or are taken from the pod. According to MacIntyre, being a surrogate mother isn't unusual for Granny. "Granny did a lot of babysitting," she told The Dodo. "She's not even of reproductive age, but she's been helping care for other animals for years." The sighting is one among many happening near another gathering -- an annual collection of orca researchers, conservationists, media and activists that happens on San Juan Island every year, colloquially known as "Superpod."